The controller built for bear paws. 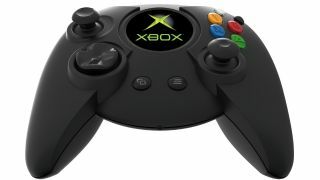 If you were even vaguely paying attention to the original Xbox back in the early '00s, it was impossible to ignore the infamous "Duke" controller. While not an official name, the controller certainly wore it well; with its massive size and heft, it evoked a sense of royalty and opulence (though the truth is it was named after a founding Xbox team member's son). Still, it was often mocked for its unwieldy design, and when Microsoft introduced the Xbox Controller S, the Duke was all but forgotten - until now. "When I was first out pitching Xbox - because I was essentially fronting this thing to the public - I just took an incredible amount of crap about the size of the controller," Blackley told Inside Xbox as he reminisced on the early, formative days of the console. "It was huge, and people really didn't like it. I had things thrown at me on stage." Years later, Blackley was cleaning out his garage and came across one of the old Duke model controllers. He made a few cheeky jokes about how difficult they were to produce ("it takes 30 percent of the world's supply of plastic to make," he quipped on Inside Xbox), and figured that because of the negative reception the controller got years ago, that would be the end of it. But people took notice, and Blackley asked if there was interest in a re-release. There was. Head of Xbox Phil Spencer reached out, and soon Blackley was in the process of updating the Duke for a new generation. "The trick about life, and getting cool things to happen, is not giving up on a cool idea," Blackley said. "All of these people love this controller so much. And what a beautiful way to end the story of all the abuse I took in 2001, to have all of the people here now able to play this new controller." The plastic dome that once simply covered an Xbox logo decal has been replaced with an OLED screen that displays the original Xbox boot sequence when turned on, a nod to the controller's lineage. It's certainly a nice flourish, and more interesting than a nearly 2-inch-in-diameter bubble that doesn't do anything. "It needed to be updated, to be somewhat modern," Blackley explained. "So I took out my knife and my hot glue gun and I pasted in an OLED display in it on my kitchen table. And I put a video of that on the internet so that it was, you know, sort of impossible to ignore." There are also new shoulder buttons. While bumpers have become standard for modern controllers, the original Xbox only had triggers in the back. The New Duke adds small shoulder buttons to rectify this, and Blackley expects there to be split opinion over their inclusion. On the one hand, it's not 100% accurate to the original design to add these new nubs. On the other, can you imagine clumsy some games would be if bumper functions were simply remapped to those Black and White buttons on the front? Personally, I'm pro-nub. I also always preferred the Duke to the Controller S though, so maybe I'm weird. The New Duke will launch in limited quantities in April. You can pre-order yours for $69.99 via GameStop.